Web installation is getting very common especially when downloading software from Microsoft. The good thing about using web installation is it only download what is necessary, saving both time and bandwidth to install the software. However, for advanced users who doesn’t want to re-download, they prefer to go for offline redistributable setup. A one time download on a huge setup file and there is no need to download again whenever there is a need to reinstall. The sames goes to Microsoft Visual Studio 2010 Express. 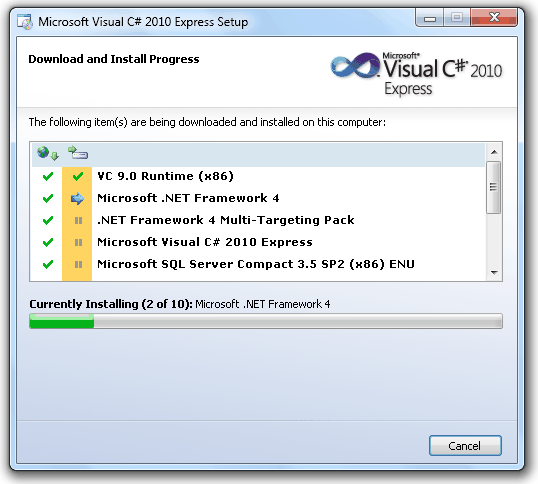 If you want to download Visual C# 2010 Express, you can use the web installer vcs_web.exe file and it will download all necessary files and install it on the computer. The official download page also contains an ISO image (VS2010Express1.iso) file at 695MB in size that enables you to install Visual Studio Express products without requiring Internet access during installation. Out of curiosity, I tested another method on how to offline install Visual Studio Express without downloading the whole image file. From the looks of it, the method has some really cool tricks which is extracting the web installer, opening the baseline.dat file with a text editor to extract the URL which the web installer downloads the files from, and finally installing it with a custom command line switch. I’ve installed Microsoft Visual C# 2010 Express using the method above and everything seemed to fine until when I tried running Microsoft Visual C# 2010 Express. 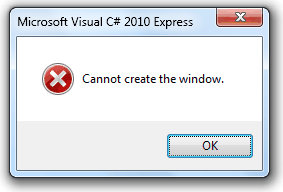 All I get is an error window telling me “Cannot create the window“. There are a lot of tips on how to fix this error such as reverting the machine.config to the default version, reinstalling .NET Framework, reinstalling Visual Studio 2010, recreating msvcm100.dll, but none of it fixes the “Cannot create the window” error. Visual C# 2010 Express cannot run if any of the required components are not installed. So the best bet is to either use the web installer if you have a fast internet connection or simply download the all-in-one ISO file and burn it to a CD, mount it as a virtual drive or extract it with 7-Zip. alternate way to get the offline installer is from dreamspark..! **you need to be a student.